October is when the school year gets into full swing and we start to have schools raising funds. Glendale P.S. in Welland, under the direction of Ryan Rumsby, donated $522.62. Alexander Graham Bell P.S. in Ajax, under the direction of Barb Kettle, donated $1643.67. LaSalle P.S. in LaSalle, under the direction of Martha Martin, donated $2522.62. 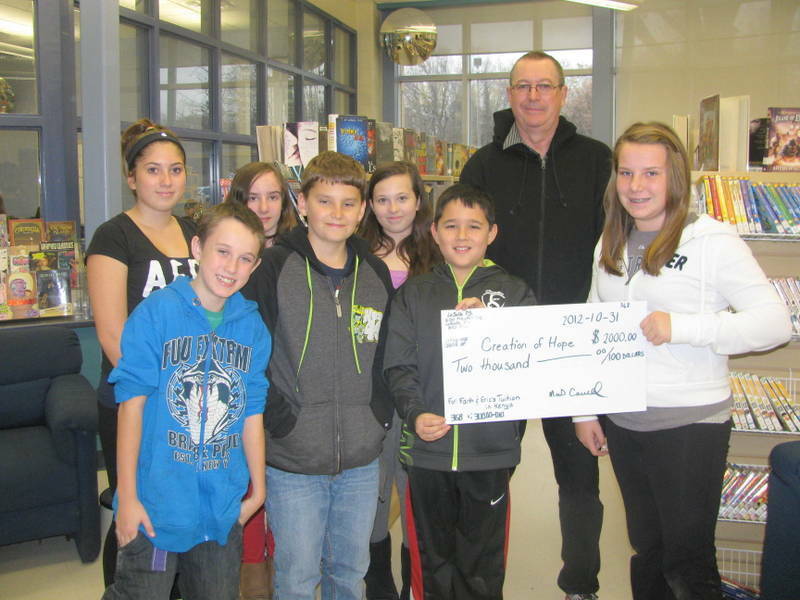 Above, students from LaSalle Public School presenting their cheque to Eric Walters. All three schools have agreed to allow the money to be used for high school tuition fees in the coming school year. 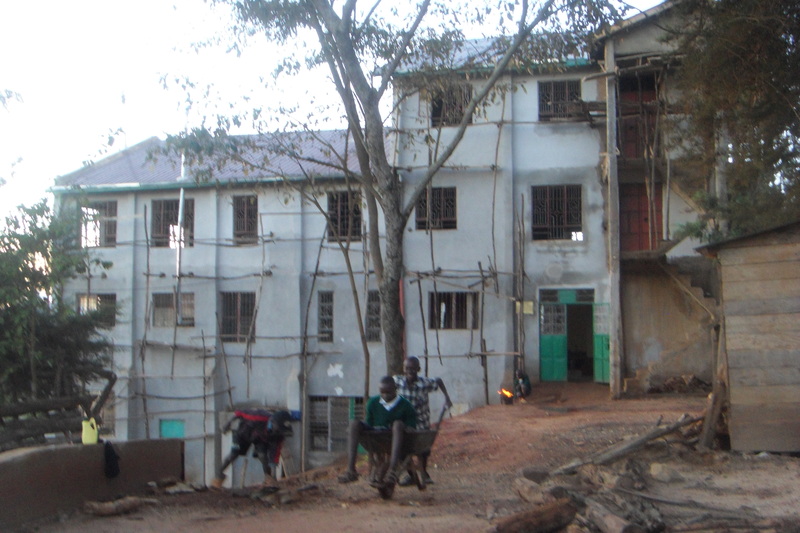 The Kenyan school year begins in January. Children who have qualified for high school or have sufficient marks to remain in high school must pay a yearly fee. This fee is dependent upon the ‘level’ of the school (local, regional or national – with each becoming more expensive). Last year we had 21 students in high school and one student in post-secondary. We know we will have one more high school graduation but we anticipate we will have 24 students in high school. Until they write their exams in late November/early December we do not know which of our Grade 8 students will qualify to go on and to which level they will qualify. 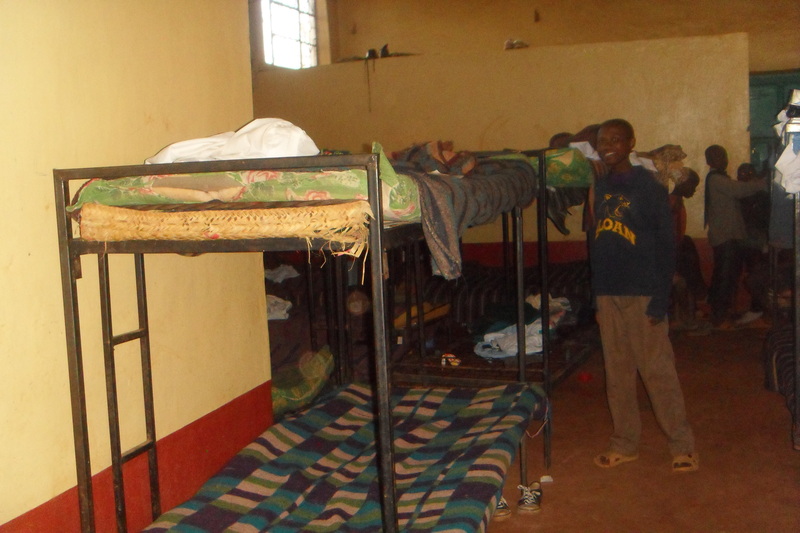 There are also extra expenses involved with the first year in ‘sending’ a child off to school as they need the school uniform, personal supplies (including things like a wash basin, mattress), and specific books. All three of the schools listed above have agreed to apply their funds directly to the high school costs. LaSalle has an ongoing relationship with two children, Faith and Richard, and will pay for their tuition specifically and then have the remainder of their funds applied to support other children. It is only an estimate at this time but we will probably require around $6000.00 for high school tuition. Once we have all the facts and figures we will get back to the schools to let them know exactly which children they supported – how their money was used! Individual donations and some thanks you signs! Jill and David Powell made a donation to support the whole program for two days. Margaret Louise Phillippe and Gregory Phillippe made a generous donation to support the entire program for 10 days. Aimee, Sara, Airah, Brooklyn, Ella and Isabel, from Prince George, B.C. donated money purchase a goat and 3 chickens for a needy family. These pictures will be posted on the website when they are given out. 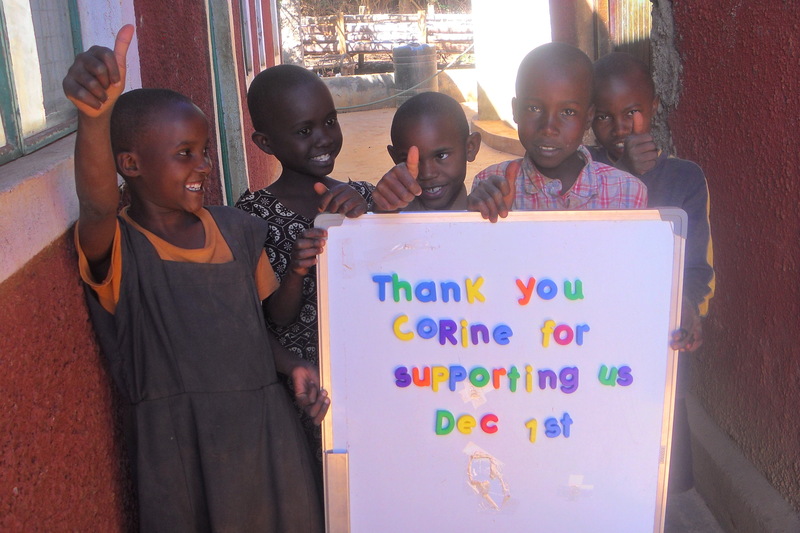 Corine provided for day of support for the whole Rolling Hills Residence – food for 44 children, their daily needs including medical, the salary of the matron, night watchman and tutor, and the electricity, sanitation and water for the entire building . . . amazing what $50.00 can do! 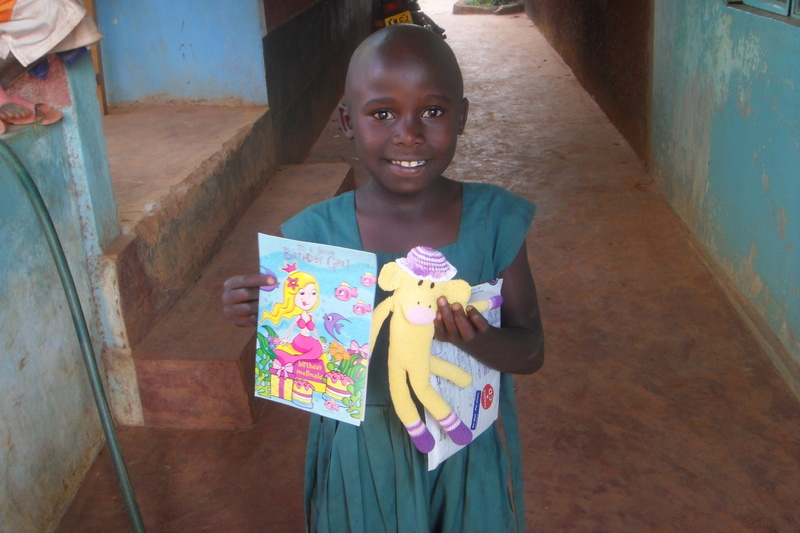 Chloe supported the entire orphanage for December 10th! 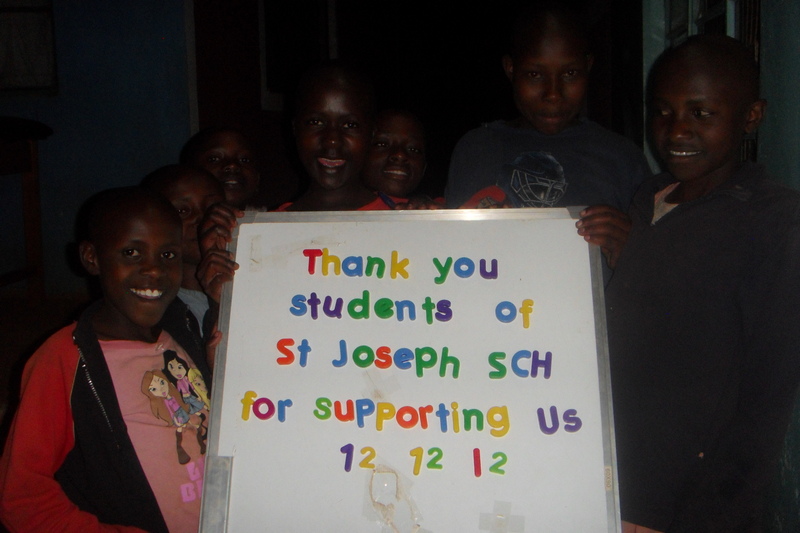 The students at St. Joseph supported the Rolling Hills Residence for a day. 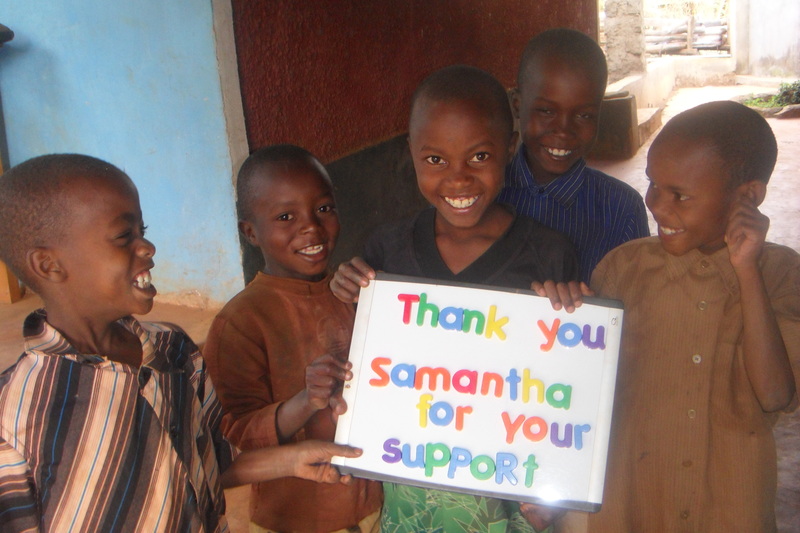 Samantha is a young girl who is an ongoing supporter and continues to help our children. They wanted to let her know how much they appreciate her efforts. The students of Christ The King in Whitehorse, under the leadership of Tanis, made a donation and then decided as a group how to spend the funds they raised. Below are pictures – thank you photos – showing some the things they decided on. Three children with new school uniforms. 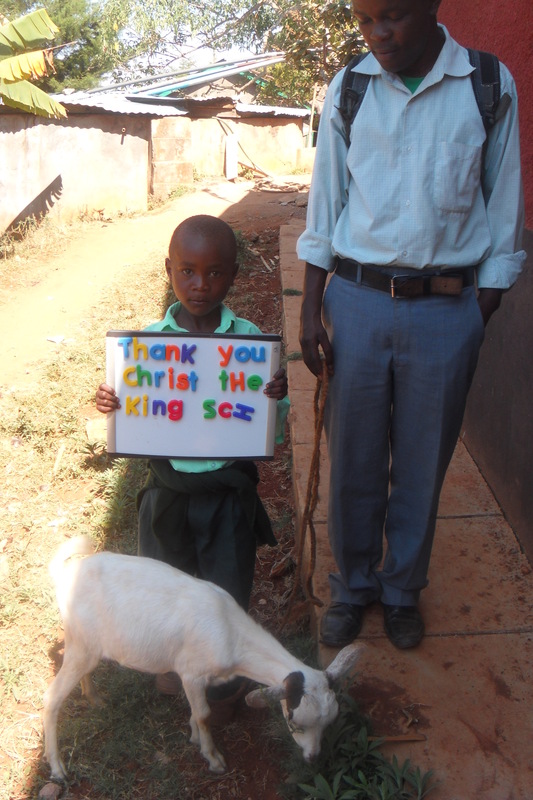 I love when an orphan gets a goat! This is a life changing event. Our sponsors often send their child a small gift. Sending things halfway across the world can often take a long time but so far every present sent has been received. We always try to send back a picture to the sponsor showing their child holding all of the precious items sent and received. 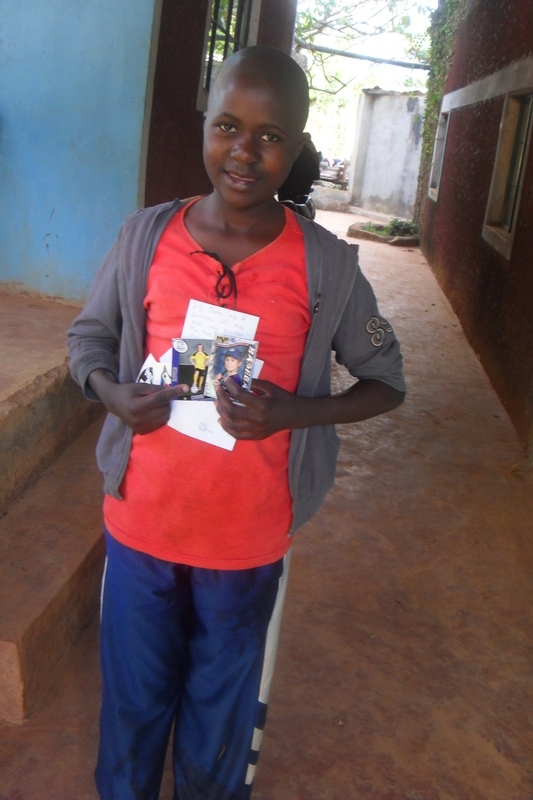 A birthday greeting from April for her sponsored child Mbula– I think the smile says it all. Many of our sponsors have made a generous donation to provide for their child as well as presents for other children in the extended family who might not have anything. Our hope is to stretch this money sufficiently that each child will receive new clothing and shoes as well as some other less practical items. In addition many sponsors have sent over a small package or a greeting card to be shared with their child. The generous nature and kind spirits of our sponsors continues to inspire all of us. If you give water you give life. 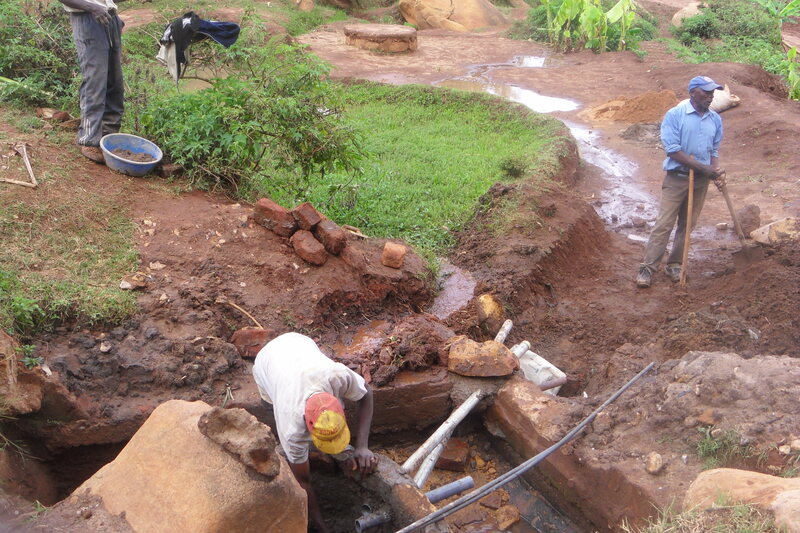 We have been partnering with a group of people who gather their water at a small puddle in the mud at the ‘bottom of the hill’ a few kilometers from our residence. This project was launched almost a year ago, but sometimes partnerships take time to develop. 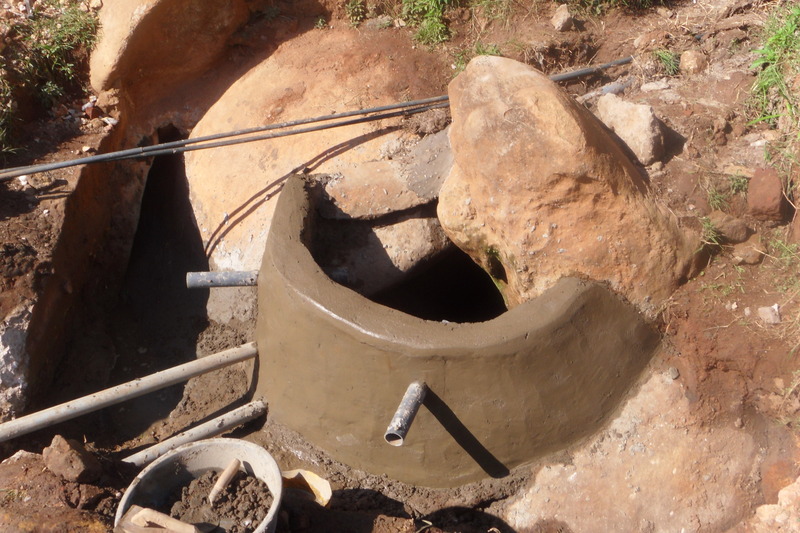 We provided the cement, iron rods, pipes and hardware, and expertise of a water engineer and stone mason and the people in the community provided sand, gravel and labour. Previously their water was merely a trickle coming out of the rocks and settling into a small pool in the mud. This new source will be clean and fast running. 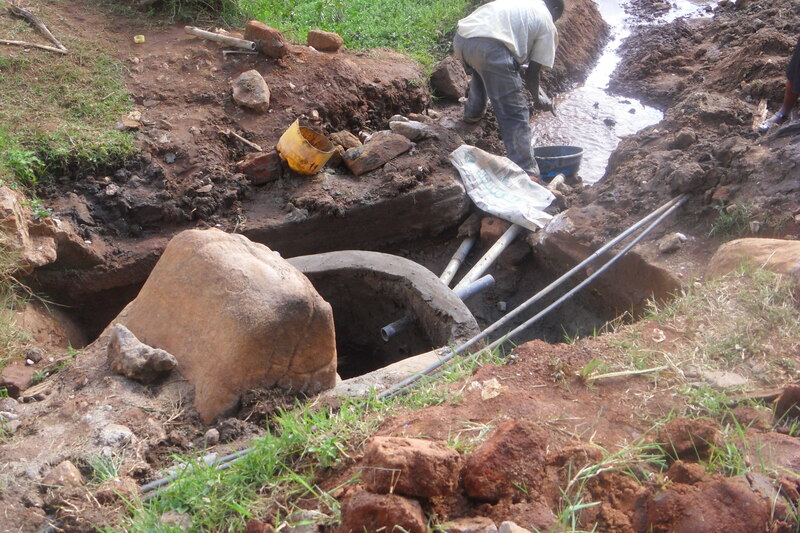 Here are some pictures of this almost finished project, funded by the students of Ryan Rumsby. 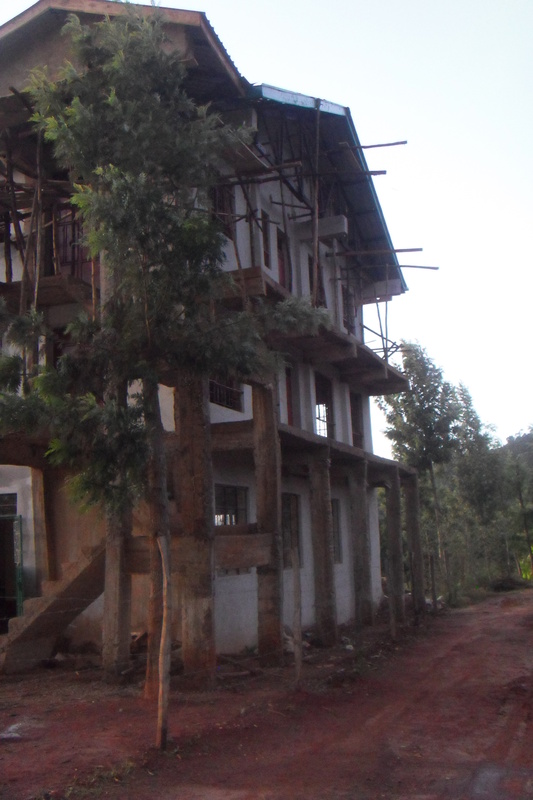 Bit by bit the whole residence is being completed. A side view – also showing some our kids playing and smiling! We have added a new sponsor this month with three new ones coming ‘on board’ in the next month. As we are limiting the number of active sponsors currently to 115, the new sponsors take over when another individual is no longer in a position to continue the financial commitment. 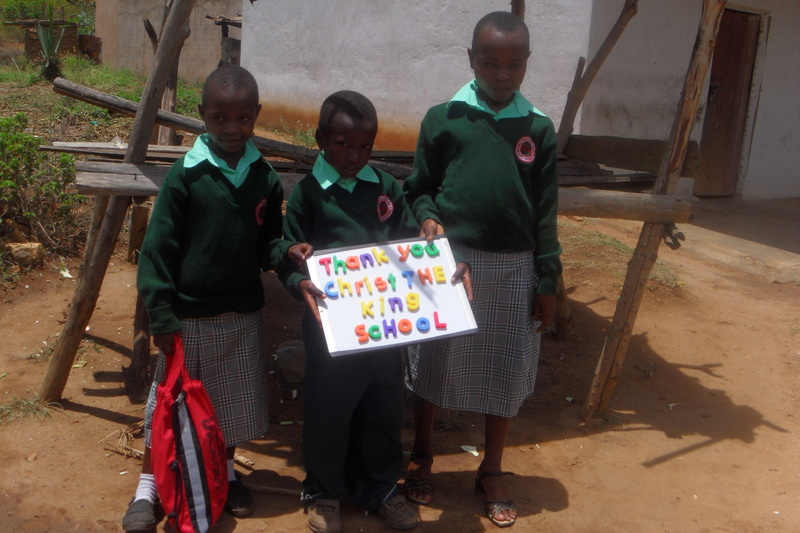 We actively encourage our sponsors to write letters, send pictures and then each summer we hope that some of them will have a chance to travel to Kenya to meet their sponsored child and their extended families. One of my greatest joys this past summer was being present to see these first meetings. We strongly believe that this commitment is much more than simply providing money. When you get involved with a child you give them back a role that was lost – they are a member of your family.